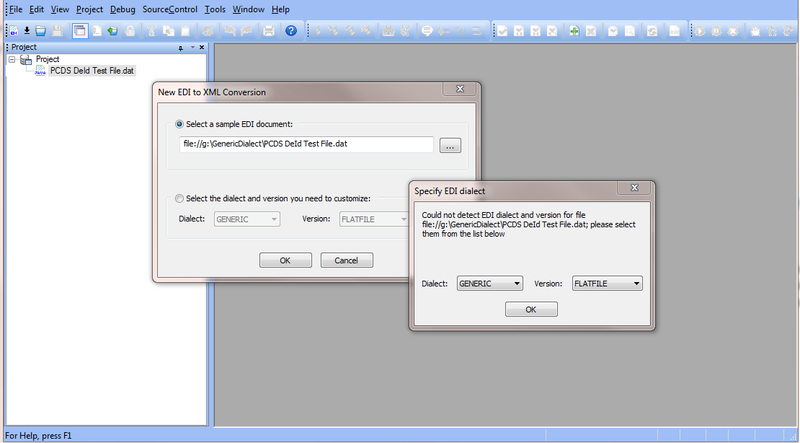 When creating a new EDI To XML Conversion, Stylus Studio gives to the user the opportunity to load a sample data file to bootstrap the conversion. The auto detect algorithm has been enhanced to fall back to the Generic dialect when all attempts to detect well-known EDI formats fail. 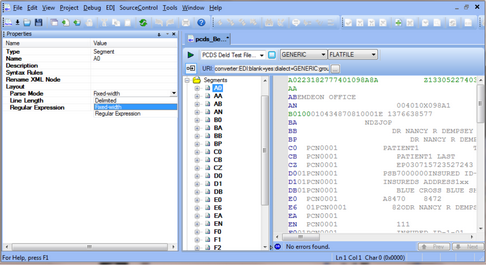 Once the user clicks OK on the “Specify EDI Dialect” dialog, the dialect and version get set. When the user clicks OK on the “New EDI to XML Conversion” dialog, Stylus Studio executes a discovery algorithm that tries to create a SEF skeleton based on the sample data and initializes the URI field with the appropriate properties to engage the generic dialect. In addition to the dialect and the version, the message property is also set to instruct the converter on which message it should expect to parse. The Segment properties have been enhanced with a new property set named Layout. The new property set features three new properties. Parse Mode defines how a segment should be interpreted: Fixed-width, delimited by a separator or matched by a regular expression. The Line Length property is a numerical value that instructs the engine how many characters it should expect to find in a segment. This property plays a role when parse mode is set to Fixed-width. The Regular Expression property sets an expression used by the engine to match a segment. The syntax supported by the XML Converters is based on the Java class java.util.regex.Pattern. Stylus Studio validates the expression and reports an error when a parsing failure occurs. All new properties are wired into the UNDO architecture. 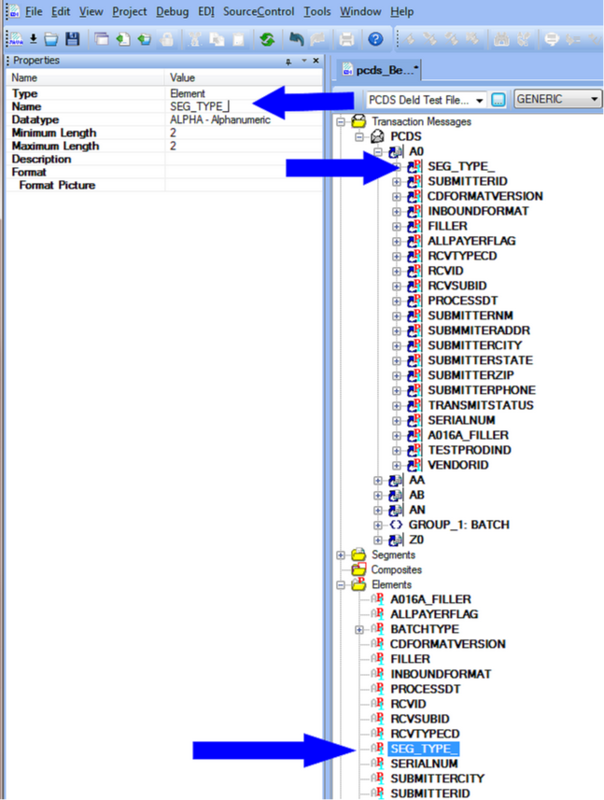 After changing a value, the user can rollback using CTRL + Z and CTRL + Y for REDO. The XML Converts type system has been enhanced with several new data types. This allows the user to perform a more precise lexicographic analysis. 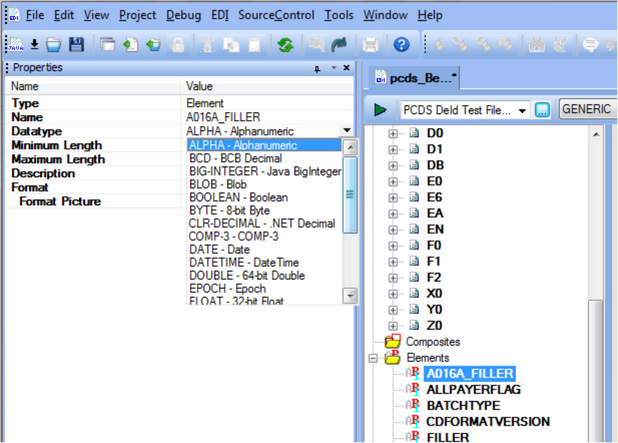 Each data type provides a very granular control though a dedicated property set. 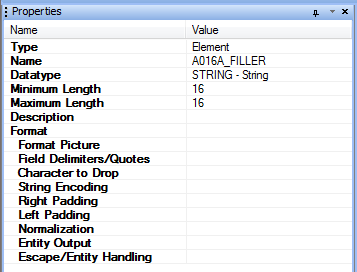 In the screenshot below we can see the String type and its properties. The Format property set has been introduced specifically for the Generic Dialect. Stylus Studio canvas rendering has been enhanced to trap new events generated by the Generic Dialect. 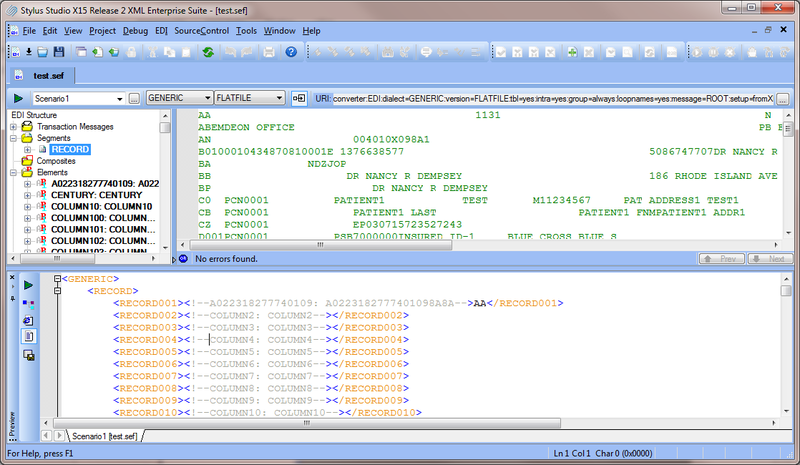 In the following screenshot, you can see three different states: green when a segment and its fields fully match the definitions, blue and gray when a segment was matched but not all its fields are recognized, and red when the data is interpreted as unknown. When working with the Generic Dialect, the process of defining new segments and elements are very iterative by nature. It‘s common to rename objects to better fit the data semantic. To provide the best experience, Stylus Studio has been enhanced to make sure that every time the user renames a segment or an element, all references are automatically updated in the data model and live in the EDI Tree Structure. In addition, the renaming operation and reference update has been wired in the UNDO architecture. Prev: "My Gutenberg Project by Dana Pearson" Next: " Transforming XML to Fixed-Width"